In February 2019, NHS England published their monthly suspected cancer and diagnostic waiting time statistics for December last year, providing a full picture for 2018. 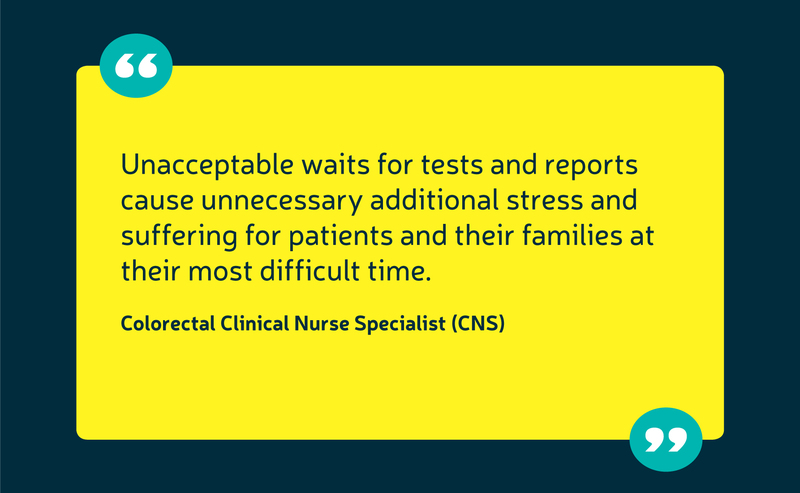 In this blog, we look at how the waiting time figures for bowel cancer tests have changed over the last two years and discuss what this means for patients and the bowel cancer workforce. 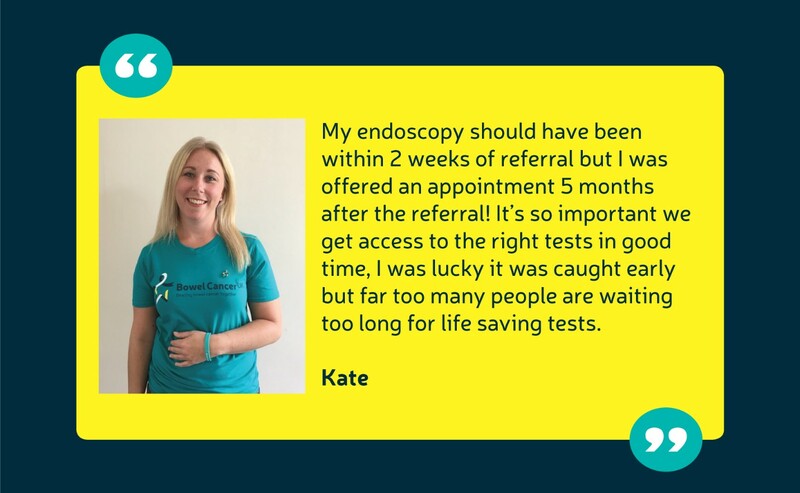 Under NHS rules in England, patients should wait no more than six weeks for endoscopy tests (colonoscopy or flexi-sigmoidoscopy) that can diagnose bowel cancer; and no more than two weeks to see a specialist if they’ve been referred urgently by their GP for suspected bowel cancer. These targets exist to ensure patients receive timely access to tests that can diagnose bowel cancer early, when it’s more treatable and even curable. However, as we’ve highlighted in our Capacity Crisis campaign, increasing demand for bowel cancer tests is outstripping capacity, and this is having a huge impact on patients’ opportunity to be diagnosed early. The latest NHS figures reflects this lack of capacity, showing a substantial increase in the number of patients waiting and hospitals in breach of their targets in 2018 compared to 2017. Nearly 60% more patients each month waited more than six weeks for endoscopy tests at their hospital in 2018 compared to 2017. Approximately 3,000 patients (2,889) on average each month were waiting longer than six weeks in 2017, compared to over 4000 (4,581) in 2018. In 2017, a quarter (26%) of NHS hospitals on average each month were in breach of the waiting time target for a colonoscopy. 2018 saw an increase to a third (30%) of hospitals each month in breach of the same target. 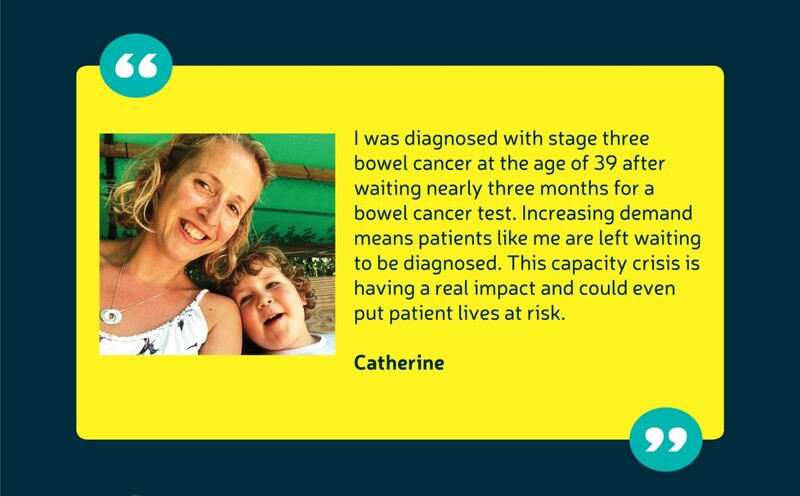 There was a 40% increase from 2017 to 2018 in the average number of patients waiting longer than two weeks each month to be seen urgently by a specialist for suspected bowel cancer. In 2017, on average 2,000 patients (2,379) each month waited more than two weeks, compared to over 3,000 patients (3,328) each month in 2018. The average percentage breach each month for the two week waiting time target increased by more than 10% between 2017 and 2018. On average, over a third of NHS hospitals (34%) each month were in breach of the two week waiting time target in 2017. In 2018, this figure increased to nearly half (48%) of hospitals. These figures highlight the impact of the capacity crisis in NHS diagnostic services on patients’ timely access to life-saving tests and the quality of care they receive. With demand for endoscopy services rising year on year, this is putting increasing pressure on NHS hospitals because there simply isn’t enough staff to deal with this growing demand. A long-term commitment is desperately needed to address NHS workforce challenges and tackle staff shortages. We launched our Capacity Crisis campaign in autumn 2018 to highlight this issue, calling for investment into an NHS workforce ahead of the publication of the NHS Long Term Plan. Published in January 2019, the NHS Long Term Plan outlined huge ambitions for the NHS and cancer over the next decade, but there is still no long-term workforce plan to accompany it. What's happening in the devolved nations? Across the UK services to diagnose bowel cancer are struggling to cope with increasing demand for crucial diagnostic tests and we’re working hard to campaign for change by letting those with the power know that this is unacceptable. In Scotland our work has resulted in a national Clinical Lead for diagnostics being appointed by the Scottish Government and the development of an Endoscopy Action Plan. In Wales, a newly funded Endoscopy Programme Board is being established to transform endoscopy services and improve outcomes for those affected by bowel cancer. 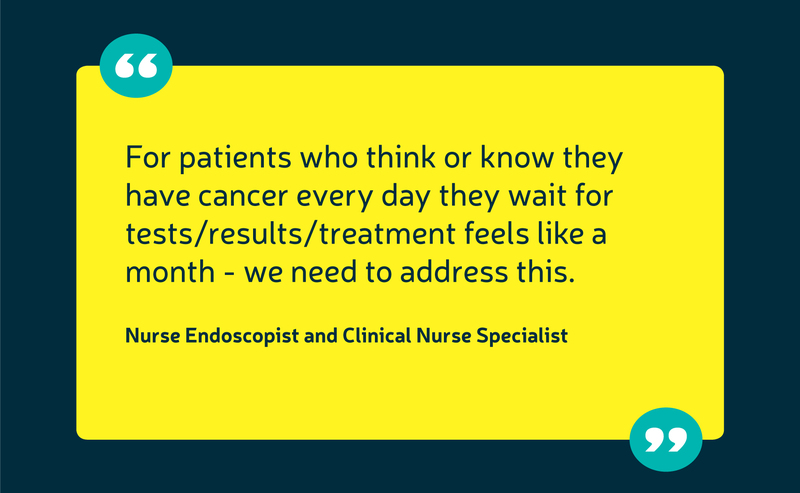 In Northern Ireland we’re pushing for the development of a Cancer Strategy, which would include detail on how the endoscopy crisis could be tackled.